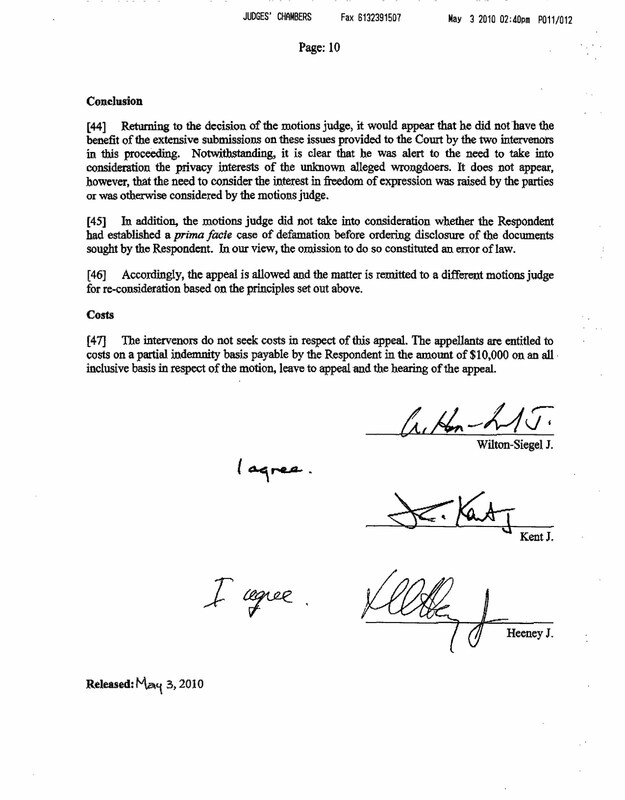 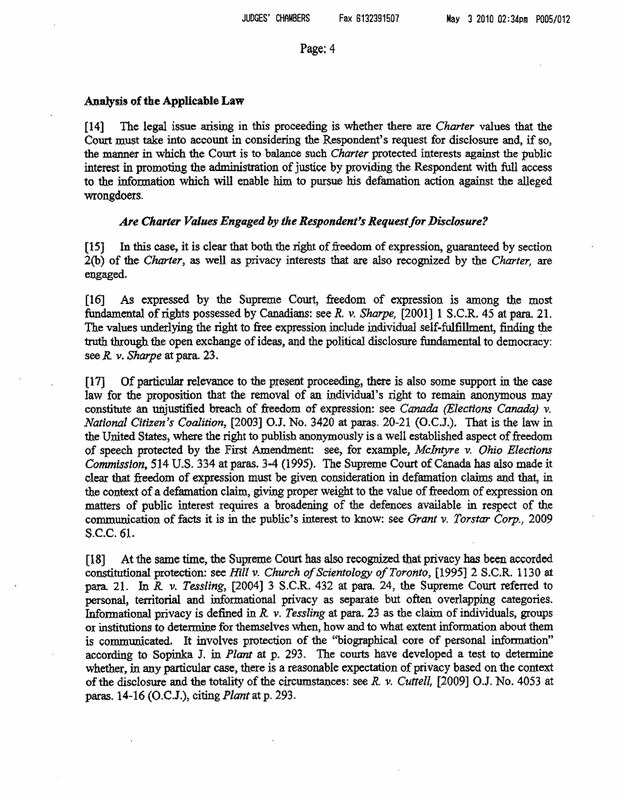 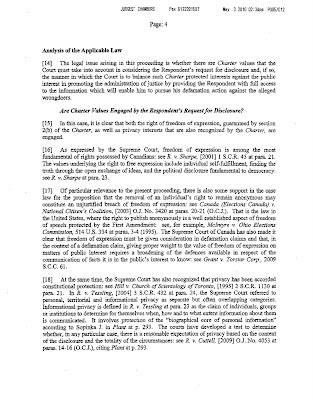 A great ruling out of the Ontario Superior Court today. 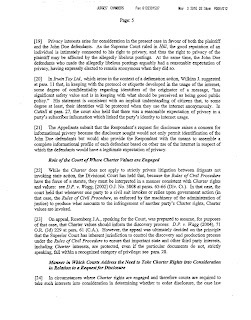 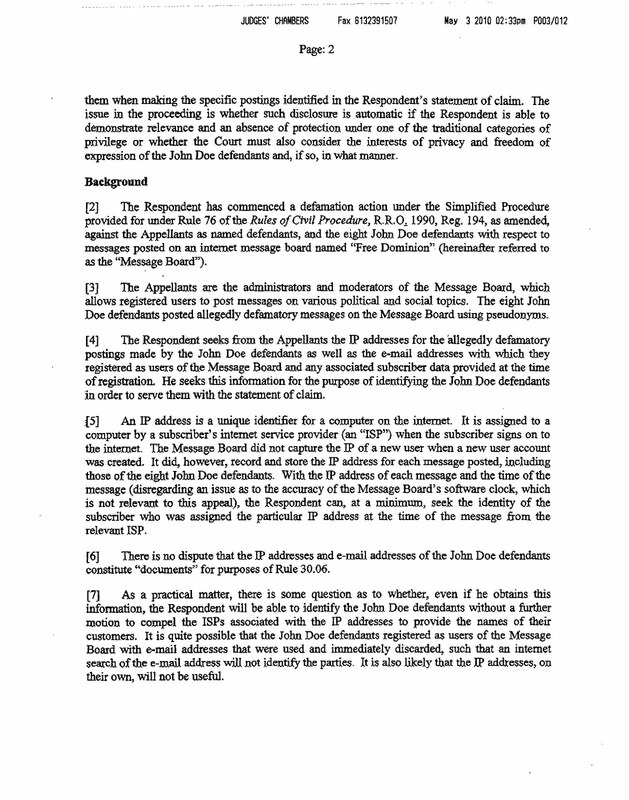 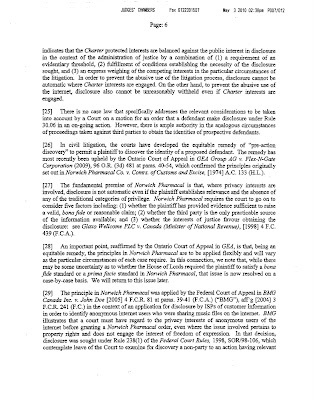 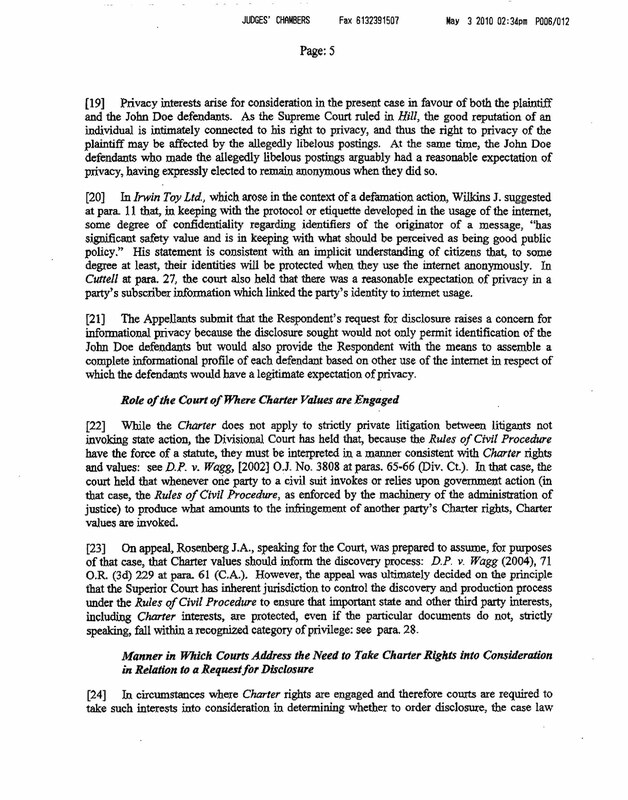 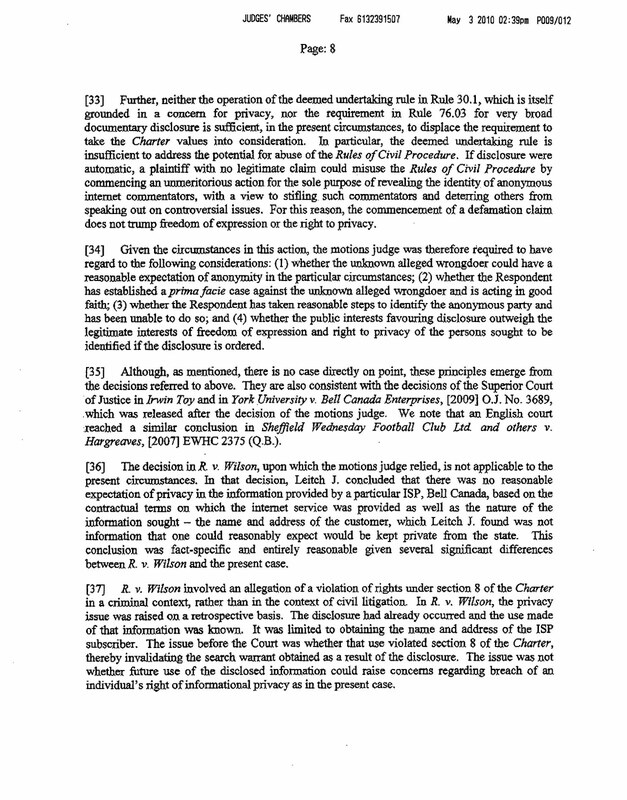 The issue in the case was if a person just needed to file a statement of claim to obtain disclosure of private Internet Addresses, or if the person would need to actually prove part of their case prior to receiving disclosure of a private nature. 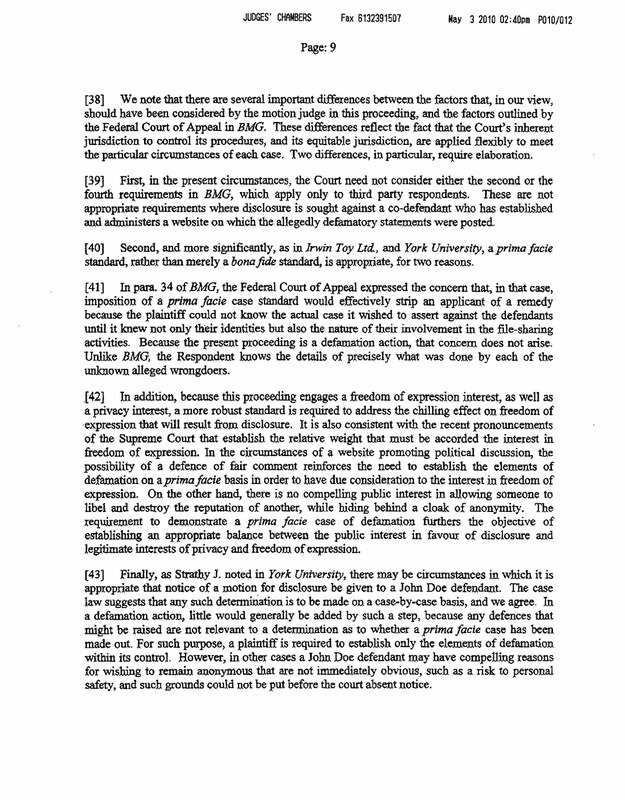 You can read more discussion about this ruling on the FreeDominion website. 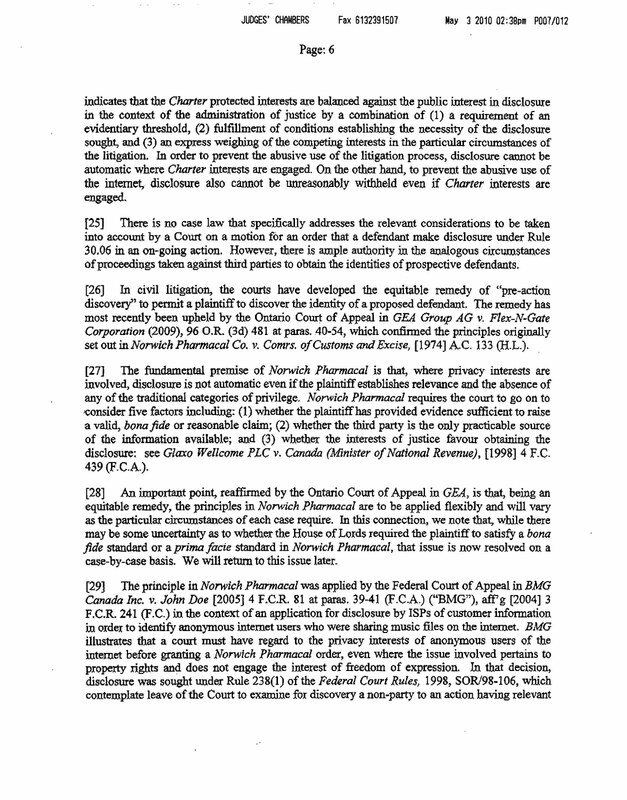 Returning to the decision of the motions judge, it would appear that he did not have the benefit of the extensive submissions on these issues provided to the Court by the two interveners in this proceeding. 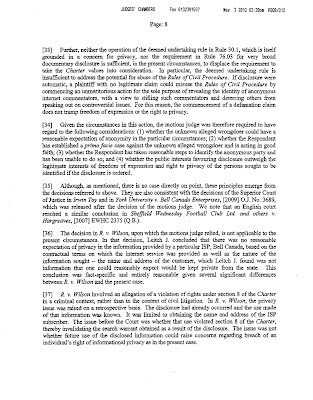 Notwithstanding, it is clear that he was alert to the need to take into consideration that privacy interests of the unknown alleged wrongdoers. 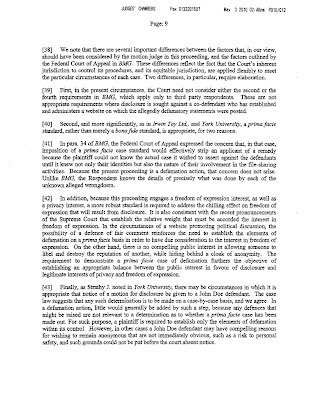 It does not appear, however, that the need to consider the interest in freedom of expression was raised by the parties or was otherwise considered by the motions judge. 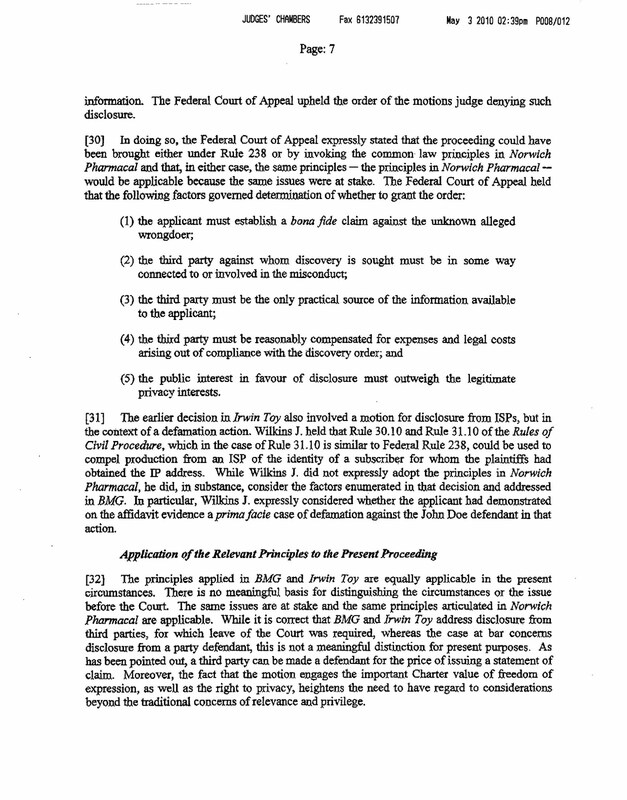 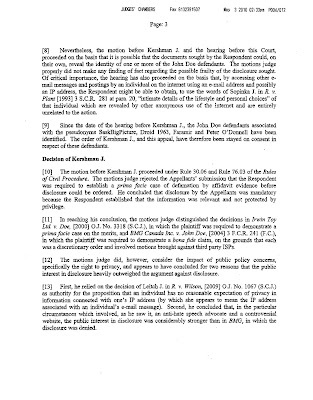 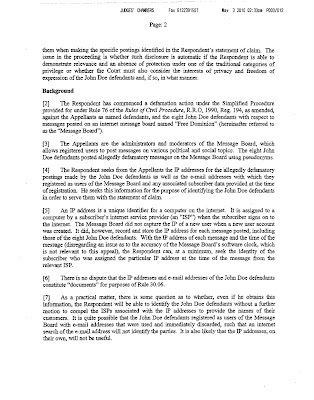 In addition, the motions judge did not take into consideration whether the Respondent had established a prima facie case of defamation before ordering disclosure of the documents sought by the Respondent. 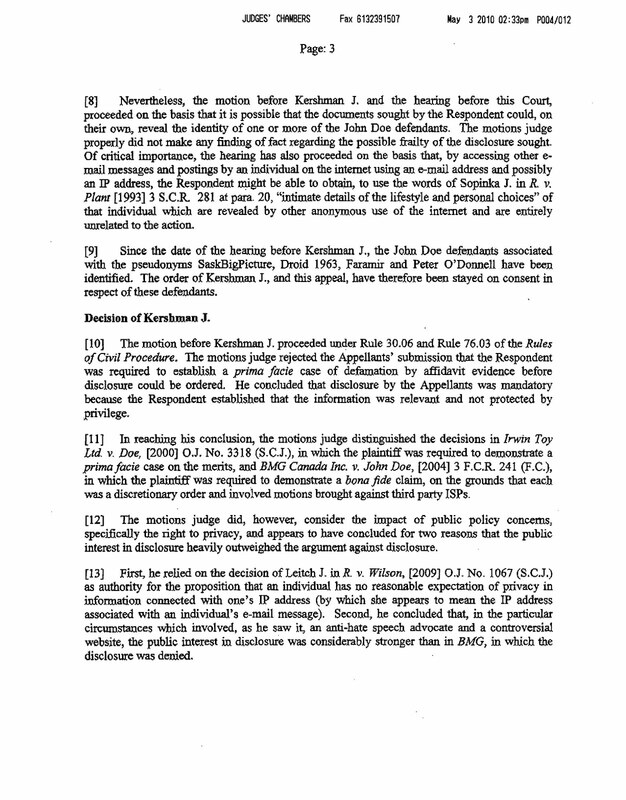 In our view, the omission to do so constituted an error of law. 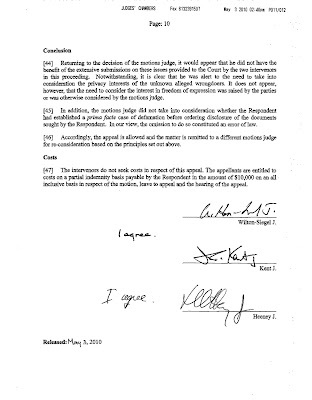 Accordingly, the appeal is allowed and the matter is remitted to a different motions judge for re-consideration based on the principles set out above. 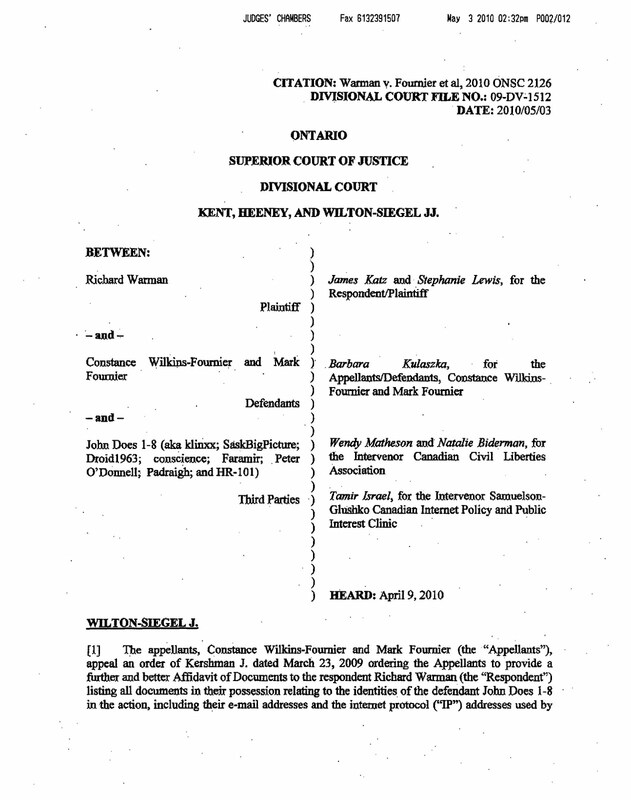 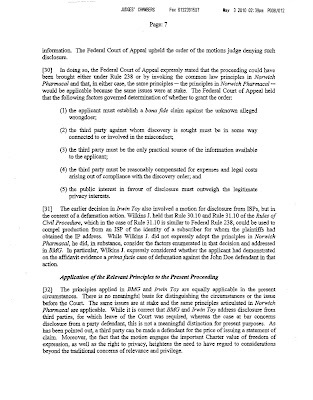 The interveners do not seek costs in respect of this appeal. 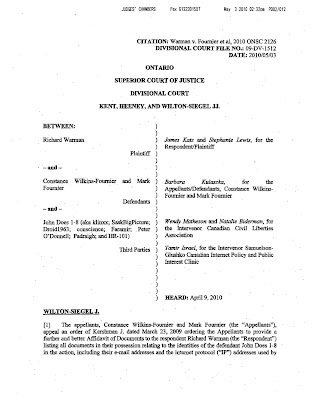 The appellants [Mark and Connie Fournier] are entitles to costs on a partial indemnity basis payable by the Respondent [Richard Warman] in the amount of $10,000 on an all inclusive basis in respect of the motion, leave to appeal and the hearing of the appeal.